Contrary to what many might think, comic books and cartoons can be more than an enthralling distraction on a rainy afternoon or a pleasant way to start your Saturday: According to University of Calgary postdoctoral fellow in comic studies Nick Sousanis, they can be powerful communication and learning tools as well. Sousanis will be leading a free community conversation on the subject, titled, “Experiments in Visual Thinking and Knowledge Construction: a Q&A with Nick Sousanis” on Thursday, Nov. 12, from 4 p.m. to 5:20 p.m. in Room 145 Straub Hall. The discussion will center on the concept of graphic storytelling and its emerging role in the field of academia, specifically in journalism, education and medicine. His intent is to engage the University of Oregon community in a thoughtful discussion on alternative scholarship and how comics are, in fact, a valuable communication form. 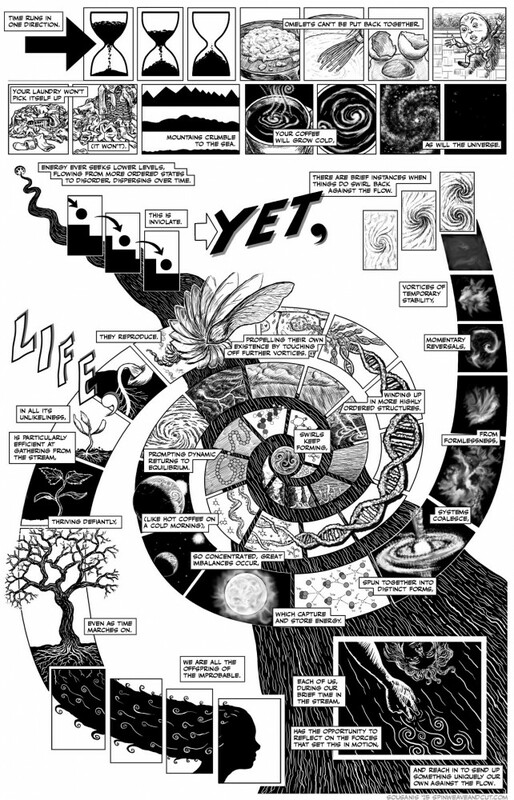 Not only does Sousanis talk the talk, but his most recent textbook on constructing human knowledge through graphic storytelling — titled “Unflattening” — is a comic book itself. The UO bookstore will be hosting a book-signing event following the talk. On Friday, Nov. 13, Sousanis will be hosting an event for graduate students titled, “Alternative Formats in Dissertation and Career Paths outside the Academy.” After writing and drawing his own dissertation entirely in comic book form, he received his doctorate in education from Columbia University in 2014. This event is also free and open to the public. It will take place from noon to 1:20 p.m. in the graduate student lounge in Susan Campbell Hall. During his time in Eugene, Sousanis will also meet with small groups of faculty in the UO Comics and Cartoon Studies Program, the School of Journalism and Communication and the Arts and Administration Program. Additionally, he’ll meet with students participating in two UO First-Year Interest Groups for time-intensive small group discussions. Sousanis’ visit is sponsored by the UO Office of Academic Affairs, the Comics and Cartoon Studies program, the School of Journalism and Communication and the Arts and Administration Program.